Information for artists who are invited to perform a demonstration at one of our meetings. You will be demonstrating your artistic methods on stage in front of 30+ artists from the Stillwater area. If you have never done a public demonstration, one simple suggestion: We already know how great your work is. (How else did we know to contact you? :) Instead of doing a simple slideshow, we are more interested in what goes on in your head. What is your process as you go from the initial creative spark to the finished piece? Please see the Meetings & Demonstrations page for the most up-to-date schedule. Camcorder and digital projector – projects a live feed of your work surface on the front wall of the room. Work environment: easel, work surface, brushes… The specific tools you use! If you are bringing a computer and/or lights, remember to bring a power strip. Finished artwork – 4-6 pieces for displaying around the stage. Promotional material – business cards, postcards, etc. The Board Members will assist you with setting up the stage. The President will welcome everybody and discuss current Art Guild events. The Program Director will introduce the featured artist with a brief biography. Snacks and refreshments are available in the kitchen. The audience is welcome to visit with the artist and to see the work up close. 8:00pm – Demonstration, second half. 9:00pm – The building is closed by the PAC staff. We encourage you to attend a meeting ahead of time, not only to get a feel for what to expect for your own demo, but to simply enjoy being around other local artists. Please contact our Program Director if you have any questions. We look forward to seeing you! All photos in this section were taken at a location different from the one where we currently meet. 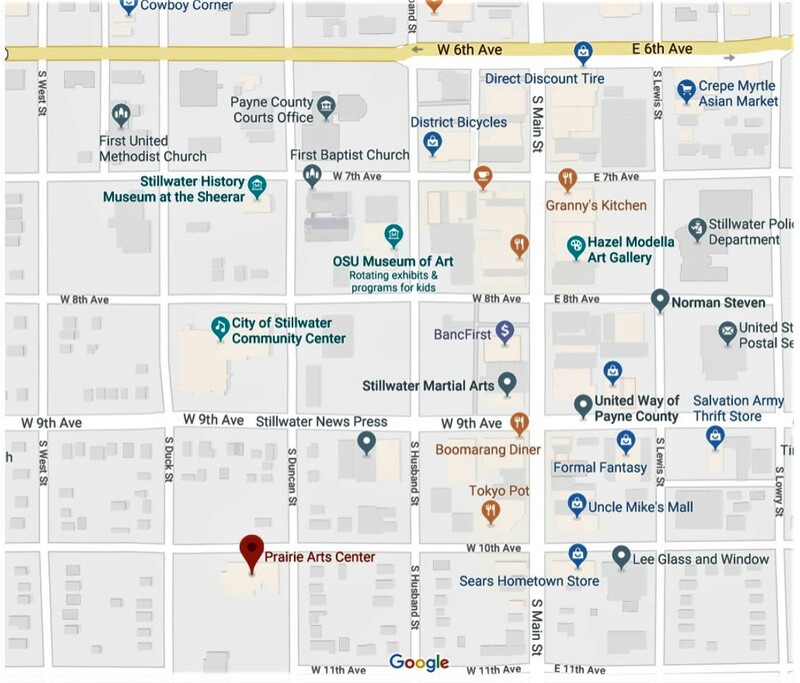 Please see the link above to the Prairie Arts Center to see our current location for our demos. Last-minute change for February demonstration!